Listen, I spent a lot of time watching Even Stevens as an adolescent. I'm sure a lot of us did. It was fun, and cute, and provided a good way to remember in which year the moon landing took place. It was great. Then Shia LaBeouf grew up, declared himself a non-celebrity, started ditching press conferences and wearing paper bags on his head and now everything's gone to hell. This behavior extends all the way back to LaBeouf's DUI in 2008, but I think we're all a little more familiar with Contemporary Shia — and no, I'm not referring to that time he was inexplicably turned into a cannibal meme (more on that later). We're not talking about the plagiarism stuff, and the "plagiarizing" of the "apology" stuff, and the "I'M NOT FAMOUS ANYMORE YOU GUYS STOP ACTING LIKE I'M STILL FAMOUS *STOMPS FOOT*" of it all. LaBeouf is officially (because it wasn't quite official before) one of Hollywood's most petulant children. And what's his most recent baffling act of douchery/Joaquin Phoenix-style performance art/punking of the world? 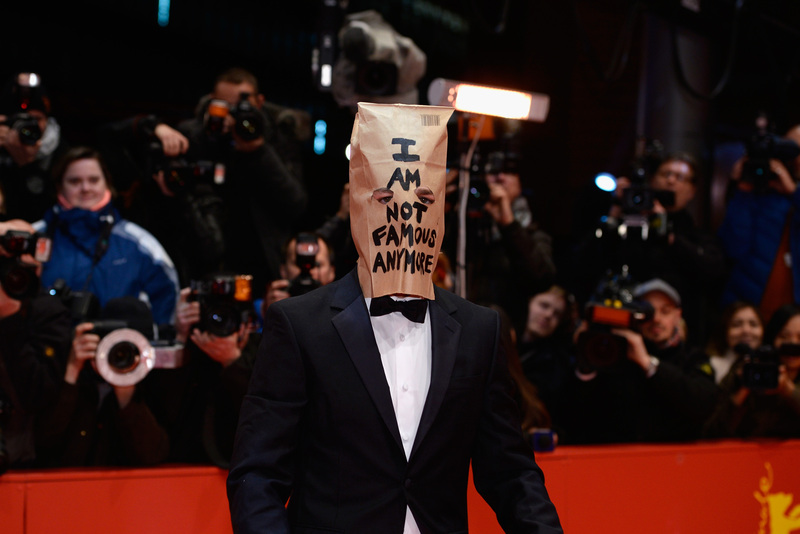 LaBeouf showed up for the red carpet of the Berlin Film Festival with a paper bag over his head. It said, big sharpie style, "I AM NOT FAMOUS ANYMORE." Subtle. When the seagulls follow the trawler, it's because they think sardines will be thrown into the sea. Thank you very much. Is Shia LaBeouf a wizard? A time traveler fed up with our time? A tortured antihero preparing for the first AMC mockumentary? Or was he just late to a brunch with fellow petulant child of Hollywood, Justin Bieber? My money's on him being coached by Joaquin Phoenix.